^ a b "Lucy's Story". Institute of Human Origins. Retrieved February 15, 2014. 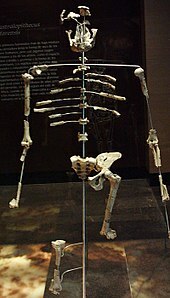 ^ "Mother of man - 3.2 million years ago". BBC Home. September 17, 2014. Retrieved October 10, 2008. ^ Desilva, J. M.; Throckmorton, Z. J. (2010). Rosenberg, Karen (ed.). "Lucy's Flat Feet: The Relationship between the Ankle and Rearfoot Arching in Early Hominins". PLoS ONE. 5 (12): e14432. Bibcode:2010PLoSO...514432D. doi:10.1371/journal.pone.0014432. PMC 3010983. PMID 21203433. 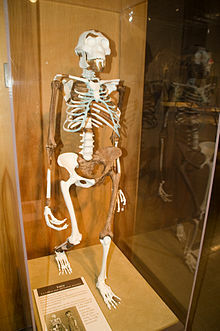 ^ "Baboon bone found in famous Lucy skeleton". New Scientist. April 10, 2015. Retrieved January 25, 2019. ^ Stefan Lovgren (November 1, 2006). 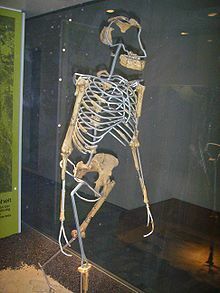 "'Lucy' Fossil Tour Sparks Controversy Among U.S. Museums". National Geographic News. Retrieved September 11, 2007.